Sometimes the best way to understand and explain complex high resolution data, is to show it on a very high resolution display. 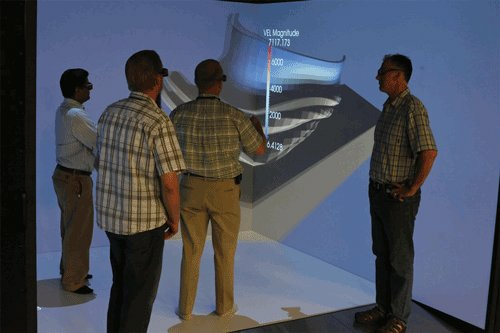 It is better still sometimes to look at the data in 3D and even walk around inside it. That way the relationships between the small and large scales become apparent. ParaView’s stereo display modes, efficient tile and cave rendering engine, and VRPN tracking interfaces make such immersion in the data possible. ParaView on Idaho National Lab CAMS visualization facility . See this section of the ParaView Wiki. See this Kitware Source article.